Preparation and manipulation of high quality DNA is a vital step in molecular biology. Although there are many methods reported for single and double stranded DNA isolations (1-5) there are few procedures that are rapid, low cost and procedurally identical for all DNA types, from plasmids to single copy BAC clones. We have noted that under conditions of high polyethylene glycol (PEG) and salt concentration (10% PEG 8000 and 1.25 M NaCl final concentrations) (6), DNA would bind to the surface of carboxyl coated magnetic particles. Once bound, the DNAbead complex could be extensively washed and finally eluted in water to yield purified DNA. We have used carboxyl coated magnetic particles (Cat No. # 8-4125B *) available from PerSeptive Diagnostics (Cambridge, MA) for all our applications. These particles are 1 µM in diameter, are superparamagnetic and display iron as well as the carboxyl groups on the surface. These surface features are important since we have obtained reduced yields when either the iron or the negative charge are removed from the solid-phase surface. We have adapted the procedure, called SPRI (solid-phase reversible immobilization) for use in all scales of template preparations and manipulations. As well as the standard mini, midi and maxi prep scales, we have also demonstrated the use of the SPRI technology in the extraction of DNA from agarose. Figure 1. This gel shows the various types of DNA that can be isolated using the SPRI technique. M is a 200ng Lambda HindII marker. Lane 1 shows the pUC18 supernatant after DNA binding to the solid-phase,demonstrating 100% binding. Lane 2 shows uncut pUC18, lane 3 SmaLA cut pUC18, lane 4 uncut pWE15 cosmid with 30kb insert, lane 5 cosmid cut with BamHI, lane 6 BAC clone with 240 Kb insert cut with Noti to excise the 7.2 Kb vector. From our results, shown in Figure 1, we estimate the initial binding efficiency to be approximately 100% under conditions in which the particles were in excess. Washing the solid phase then reduces this yield to approximately 80%, dependent on the types of wash solutions used. The solid-phase will bind to all types of DNA, which facilitates the same procedure to be applied to all DNA vectors and fragments. We have demonstrated the application of SPRI for the isolation of PCR products, M13 single stranded DNA, plasmids, cosmids and BACs with inserts up to 240Kb. The procedures for all these DNA isolations are identical. However, for M13 and PCR the procedure is further simplified since a cleared lysate is not necessary. 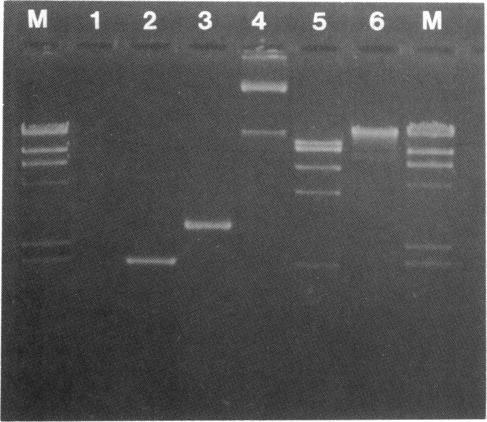 Examples of various DNA isolations are also shown in Figure 1. Our main interest in this application is the use of SPRI for highthroughput pUC isolations suitable for DNA sequencing. We have been using this approach to isolate plates of 96 clones in microtitre plate format in 1 hour which are then sequenced using the M13-21 universal dye-primer and electrophoresed on the ABI 373. The high quality of the sequence information, is typical of the data produced using this method. This procedure allows the manipulation and isolation of all DNA types using a single protocol. The SPRI method is fast, low cost (approximately $0.15 per sample in solid phase costs) and amenable to automation. The key to the SPRI technology is its potential to standardize all DNA manipulations and isolations and to enable us to perform solid-phase biochemistry to encompass many steps in molecular biology. Bankier, A., Weston,D. and Barrell,B. (1979). In Wu,R. (ed.) Methods Enzymol. 155, 52-93. Birnboim,H. and Doly,J. (1979) Nucleic Acids Res. 9, 1513. Ish-Horowicz,D. and Burke,J.F. (1981) Nucleic Acids Res. 9, 2989. Kristensen,T., Voss,H. and Ansorge,W. (1987) Nucleic Acids Res. 15, 5507-5516. Smith,V., Brown,C., BanIder,A, and Barrell,B. (1990) J. DNA Seq. and Mapping 1, 73-78. Lis,J. (1980) Methods Enzymol. 65, 347-353. SPRI magentic beads for the isolation of the PCR products.